Get your energy together and think about crafting a nice space for the kids in your garden—it might not be as difficult as you think! Regardless of the season, we want our kids to spend lots of time outdoors. Frolicking in nature, playing games in the shade and breathing in fresh air brings forth many mental and physical health benefits to young and old alike. And it sure beats any time spent indoors in front of the television (or computer or iPad). However, first prize is having your children play in the backyard where you can keep a close eye on them, instead of sending them to the park with friends. 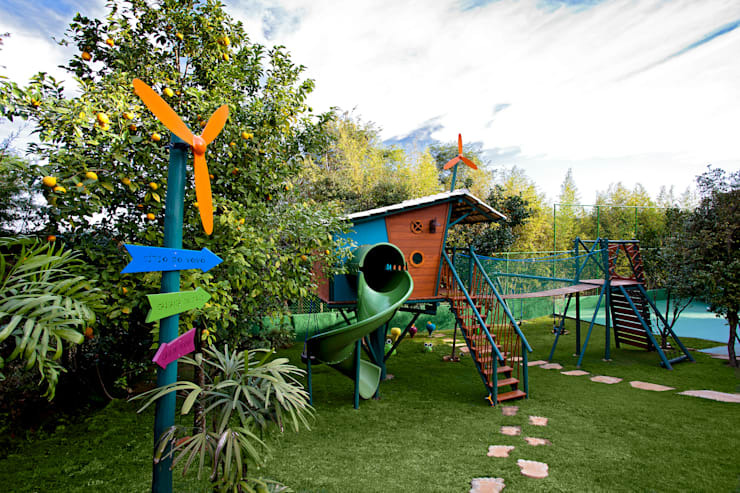 So, what can you do to make your garden the ultimate play pen for your kids? How can you ensure your backyard is the new cool spot for your kids and their friends? Let’s discover some neat little tricks to make your garden an appealing outdoor play space for the little ones! •	Is there room for a permanent slide or swing? If not, use equipment that can easily be cleared away once playtime is over. •	Select an area for a sandpit – even a small container of sand will draw little ones. •	Plant some trees for climbing (if your child is old enough). •	Have open grassy areas that are ideal for running or playing active games with friends. •	Add a table with chairs in quiet area of the garden. •	Use a tent for a temporary hiding place. 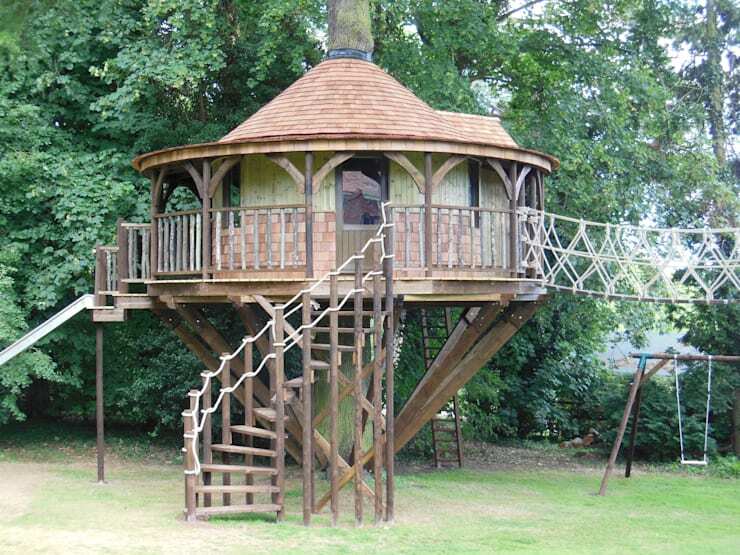 •	Build a tree house (the size and height will depend on the age of your child). •	Create a secret path for walking or bike riding in the garden (consider adding some colourful stones, bright flowers and creative garden signs to stimulate your child’s imagination). Take a look at these 5 Glorious Garden Paths for some ideas. As any parent will know, children love water. 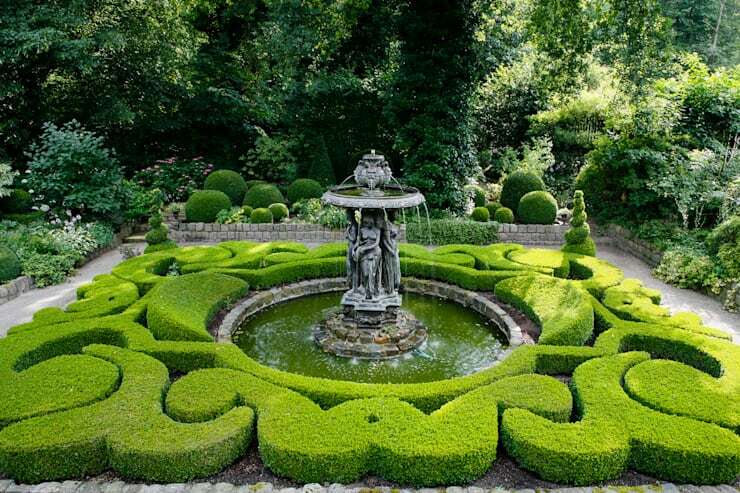 So, the easiest way to ensure water in your garden is to add a fountain / water feature. Whether you decide to go for a fish pond, waterfall, swimming pool or a simple bowl filled with water and coloured pebbles, your child is sure to be attracted by it and incorporate it onto his/her games. Fish ponds collect birds and insects, which are sure to attract the curious youngster. However, safety first: wait until your child is old enough before installing a water feature. And if you’re moving into a house that already has a water feature in the garden, make it child-friendly by using pool nets or other safe surface covers. Tip: get creative with some appropriate statues to go with your water feature (i.e. fishes, mermaids, frogs). For some stunning antique water features, take a look at UK Architectural Antiques. Busy gardens will attract busy youngsters, especially if you add some fauna to your flora. Tickle your child’s curiosity by attracting birds, insects and other animals into your garden – and this is a great way to teach your little one about the natural world. 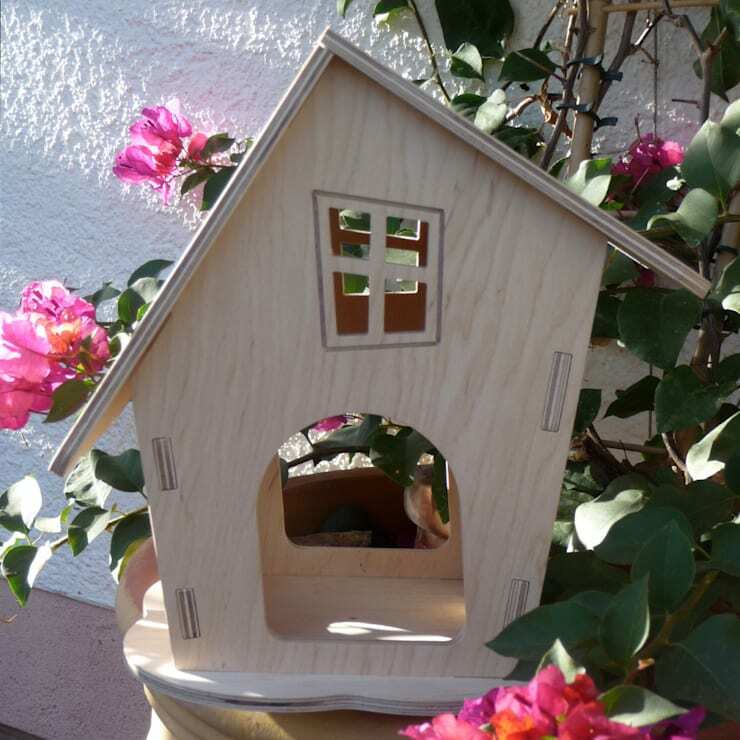 Add a bird bath or bird feeder to attract some feathered friends. And plant flowers and vegetation that attract butterflies and other insects – this will not only add some new and interesting friends for your children but will also add a lively element to your garden. Flowers that attract butterflies include: Wild peach, Flowering Salvias and Lavender. Aloes, Watsonias, Lion’s Ear, Red-Hot Pokers and Wachendorfias usually attract nectar-feeding birds such as the sunbird. Seed-eating birds are attracted to the seed heads of grasses and grains. Tip: plant patches of mixed bird seed for a fascinating collection of local birds in your garden. Chances are pretty slim that a busy and curious youngster will be drawn to a dull patch of grass with no element of excitement. A family garden needs plenty of bright primary colours (red, blue and yellow) but you can also use your child’s favourite colours to make it more special for them. Introduce an element of colour by painting walls, fences, garden benches, stones and plant pots. You can even get artistic with your flower arrangements to creatively boost your child’s play area. 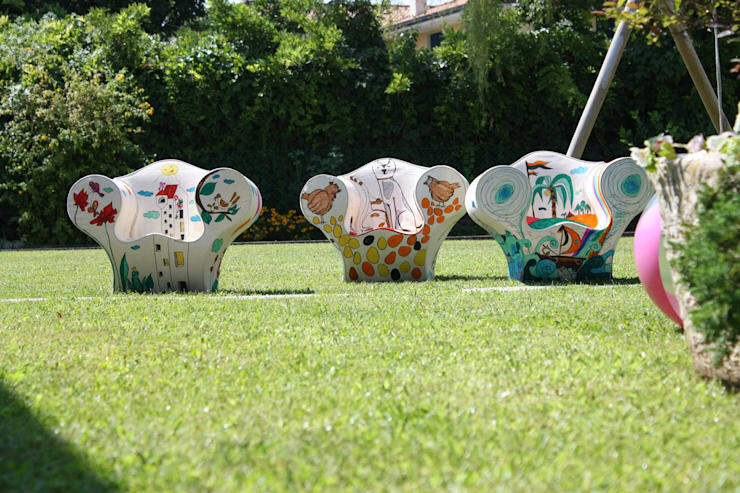 Tip: have a table and chair in the garden that is just for your child, in his/her favourite colour. Furniture that can be left uncovered is best but that doesn't necessarily mean plastic. Synthetic rattan, wood and lightweight metal are all good, durable choices. A garden can be a great place to teach a child about nature. As a lot of learning occurs through playing so adding some essential elements to your garden can help to develop their interest in the natural world. •	Planting an edible garden (fruits and veggies). •	Creating signposts for your plants and flowers – have your child help you paint and decorate them with stickers, doodling, etc. 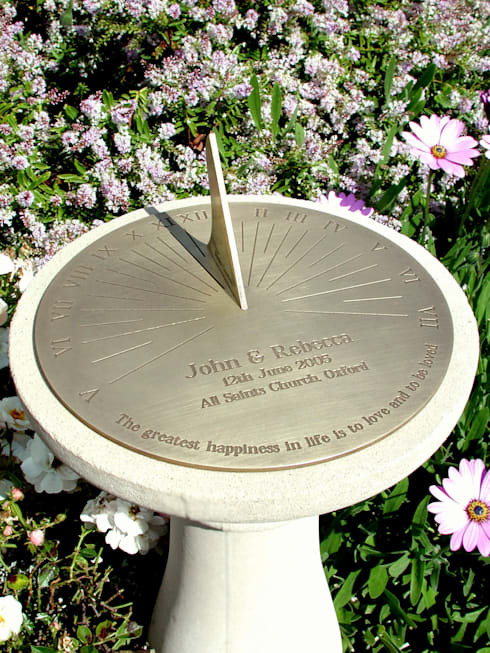 •	Adding a sundial and teaching your child how to read it. •	Setting aside an area for your children to grow their own plants. Start with easy veggies (such as beans and lettuce), which they can pick and eat. You have unlimited control over your garden so why not add something unique to appeal to a child’s love for the unexpected (and which will make him invite his friends over to come and see)? 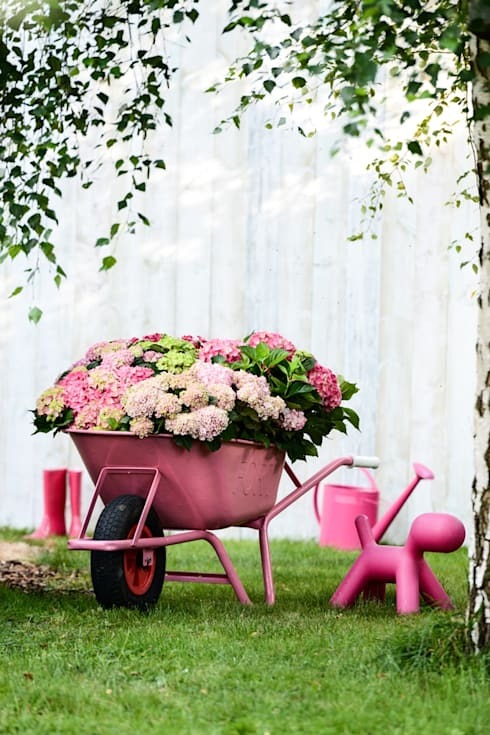 You can garden in some unusual containers, like using an old shoe, wheelbarrow, discarded toy, an old set of drawers or a plain pot plant with a face painted on. Or why not grow “midget” versions of some veggies, such as peas, corn, and lettuce? Consider hanging porcelain figures from a tree (such as fairies or dragon flies) or colourful lights to add a magical element to your child’s play area. Tip: plant a rainbow. Find flower seeds in the seven rainbow colours, then help your child plant them in a rainbow shape. Try to find flowers of similar sizes and which are appropriate for the same season. Which feature is your favourite? Any other ideas you can add to our list?